Harold Bloom?s introduction suggests Tennessee Williams is the most literary of American dramatists. 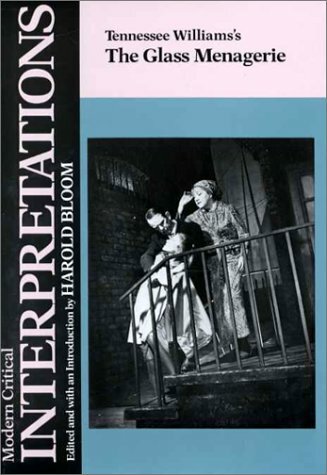 Examine The Glass Menagerie with some of the best criticism written about it, including ?Catastrophe without Violence,? ?The Southern Gentlewoman,? and ?Celebration of a Certain Courage.? The title, Tennessee Williams's The Glass Menagerie, part of Chelsea House Publishers' Modern Critical Interpretations series, presents the most important 20th-century criticism on Tennessee Williams's The Glass Menagerie through extracts of critical essays by well-known literary critics. This collection of criticism also features a short biography on Tennessee Williams, a chronology of the author's life, and an introductory essay written by Harold Bloom, Sterling Professor of the Humanities, Yale University. About Tennessee Williams (Editor) : Tennessee Williams is a published author and an editor of young adult books. Some of the published credits of Tennessee Williams include Glass Menagerie, A Streetcar Named Desire.